Technician John Armstrong supervises winter flounder. The good news began in the wee hours of Wednesday morning, when 68 flapping fish were delivered to the Wampanoag Tribe’s hatchery in Aquinnah near the edge of Menemsha Pond. The adult winter flounder had just been caught earlier Tuesday by Greg Mayhew and his son, Todd, in the Menemsha fishing dragger Unicorn. 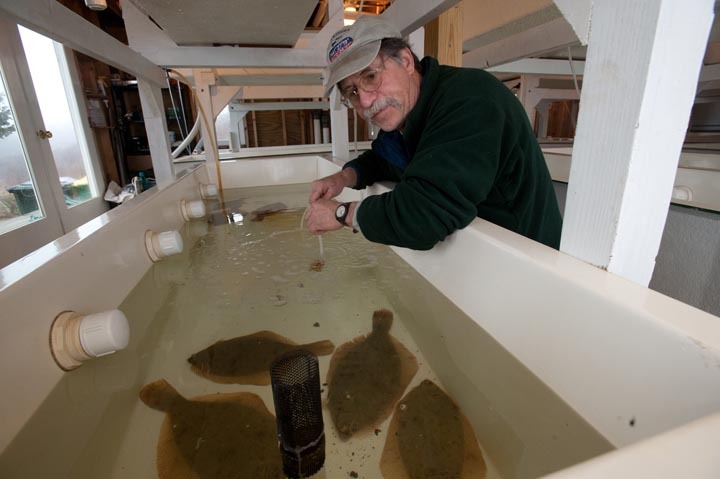 The hatchery hopes to raise over 50,000 juvenile winter flounder this spring. Later in the year they’ll be released into Menemsha and Lagoon Ponds. The activity is part of a two-year, $308,000 Sea Grant study aimed at bolstering the population of the troubled fish. The project began a year ago. After three fishing boats searched for flounder for weeks in Vineyard waters without much luck, the Unicorn found them 17 miles south of Noman’s Land in deep water. Warren Doty, a principal investigator for the project, and also a president of the Martha’s Vineyard/Dukes County Fishermen’s Association, said that the warm weather this winter, together with the scarcity of the fish, made finding the fish especially difficult. “Usually winter flounder are found in shallow water in Vineyard Sound. Either the weather is unusual and the fish patterns have changed, or the stock is truly depleted,” Mr. Doty said. “We thought the water was warm and the fish would be here earlier,” Mr. Doty said. But it wasn’t until Mr. Doty got a phone call from the Mayhews at 1:30 a.m. Wednesday morning that he knew there would be a substantial catch. A crew met the boat at Menemsha and transported the fish to the Aquinnah hatchery. The fish were kept alive in the fishing boat, in a tank of running seawater. “We’ve got adults ranging from a pound and a half to four pounds,” Mr. Doty said. They range in length from 14 to 22 inches. The project began with an extensive water and bottom sampling effort in both Menemsha Pond and Lagoon Pond. The purpose was to determine whether the two ponds were still a friendly place for juvenile fish to reside. Part of the winter flounder problem can be traced to degradation of their habitat. Winter flounder, unlike other flounder, spend a lot of their time in the winter in intercoastal inshore waters. The second half of the project involves developing the science to raise and release juvenile fish in the ponds. This work has already been started by scientists at the University of New Hampshire. In preparation for the babies, the hatchery has already been growing their food—zooplankton—in tanks upstairs, Mr. Doty said. The fish reside in labeled tanks. In the weeks ahead the fish are expected to spawn. “There are some females full of roe,” Mr. Doty said. “They usually spawn at night. If they do, we will be ready,” Mr. Doty said.